Each wedding is unique sure, but what is it that transforms a special occasion into an extraordinary one? Our philosophy is deeply rooted in our drive to craft a personalized celebration of a lifetime. Each wedding we design and style is as individual as you are. SMB event co is a place where your dreams and our experience collide to create an outstanding experience for both you and your guests. Our commitment to make every moment and small detail count is evident from our very first meeting. We strongly believe your wedding shouldn't just be a perfect day; but, YOUR perfect day. What sets SBM event co. apart? We take a different approach to the event planning process. We start by asking our client what they want the guest experience to be like – what “look and feel” do they want the party to have? Why, because the smallest of details matter. Those small details come together to create the big picture. This big picture has an intrinsic and emotional impact on people…setting the table is setting the mood. We take into consideration every visual element of your wedding. From the exact font and paper weight on your stationary, to the texture and color of your linen, the curve of your chairs, choosing the sweetest ribbon for your guest favors, and every other detail in between, we put an extreme amount of thought into every single choice. From there we create a comprehensive design plan outlining all of the event details. Once the aesthetic is set, we then get to work on the all the logistics and hand pick the vendor team to create the design direction we’ve set. The end result is an extraordinary event that’s more than about what you see, it’s about how it makes you feel! Whether you need overall color and style direction, assistance sourcing decor, vendor referrals, or just someone to bounce ideas off of, a design consultation will answer your burning questions and get you started on the right foot. This package is perfect for couples who prefer to have guidance and support every step of the way. Our planning team will assist you in creating and coordinating your vision from start to finish on logistics and a focus on design and decor. We will hand select your team of vendors, provide unlimited professional advice, and manage every detail of the wedding day to to ensure the whole process is stress-free and enjoyable. For the couple who has flexibility with their schedules and can plan the logistics but need our support to tie everything together and create a design plan that will take your event up a notch. Our coordination team will come in 6 weeks before and pick up where you left off to manage the day so you are free to enjoy all the moments your wedding day brings. Charity Gala, corporate weekend retreat, company holiday gathering, or launch party we love them all! 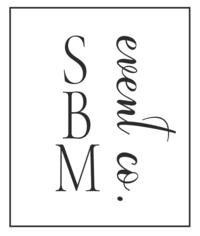 SBM event co. can produce and manage the event from beginning to end and all the details in between. Whether it’s a graduation party baby shower, bridal showers bat and bar mitzvah, to a blowout birthday bash, or a momentous anniversary- we can help you plan your special celebration. No two events are alike, which is why our pricing is customized to each client’s specific needs. Our pricing for small social events starts at $1,000 with larger events and bar / bat mitzvahs starting at $4,000. Wedding pricing begins at $2,800 for management and full services priced upon request. Typical total wedding budgets for full service start at $500 per person. Please contact us directly for pricing on smaller celebrations such as at-home dinners or baby showers. For couples who are looking for general design direction or assistance in just a few key areas. Our design process begins with a meeting to discuss your wedding style and inspiration. After an onsite walk through, to talk in further depth about your wedding we will create a design proposal including visual inspirations, a color board, and assit you in the selection of a florist and rental company. We will prepare those proposals for your review and signing. Recommendations can be made regarding all other design vendors to keep a cohesive design aesthetic. You can also expect to have our expert planning team provide you peace of mind as they take over responsibility on your wedding day so you can relax and enjoy the time with family and friends. If you prefer to add a few extra consultation hours to your package let us know, we can create just the right amount of coverage for your budget. This is the ultimate planning and design experience. Your team will be with you on every step of your journey down the aisle. As a full service couple, you will not only receive expert event design and styling guidance of every pretty little detail, you will also have access to our top event planning professionals. Their guidance and wedding day coordination is invaluable. You, your finace, and family will benefit from countless perks that allow you to sit back, relax and enjoy the months leading up tp your big day. During the planning process, your dedicated planner will be your vendor matchmaker, budget and etiquette advisor, fee negotiator, family dynamics mediator, stationery proofreader, transportation organizer, cake tasting partner (our favorite! ), favor packager, and most importantly, your planning partner. On wedding day, you’re free to sip champagne and soak in the memories while our coordination team is onsite taking care of you, your bridal party and all of the event logistics. From set up to tear down, we manage the people, the time and the details so you don’t have to. From the beginning, you’ll have the support, guidance and personal assistance you need to ensure that you enjoy the planning process and every minute of your special day. Whether you need overall color and style direction, assistance sourcing decor, vendor referrals, or just someone to bounce ideas off, a design consultation will answer your burning questions and get you started on the right foot. The five-hour minimum may be used in one or two power session for design or logistics related questions or broken up and used however and whenever needed leading up to your big day. Additional hours may be purchased individually as desired and if you need just a bit more help ask about our ala carte services that make a perfect accompaniment to your counsulting package. Your lead planner will assist you throughout the planning process and services can include: venue search, invitations, vendor selection, menu creation, decoration/floral, rental needs, entertainment and party favors. We are on-site the day of and stay through the entire event. Whatever the occasion, SBM event co. can create the perfect party. In producing your event, we start by understanding your Company, your brand, your audience and your goals. Our services may include: Secure a Location/Site, Caterer, Obtain Talent and Musical Entertainment, All Print and Paper Goods, Provide Audio Visual Equipment, Staging, Lighting, Obtain all necessary Permits and Security. Each client is unique and each event is tailor made. Contact us to create a package built just for you.